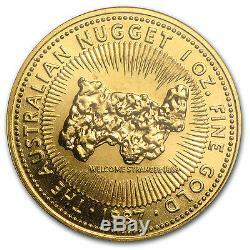 1987 1 oz Gold Australian Nugget Coin - SKU #82263. Mintage of only 131,264 coins! 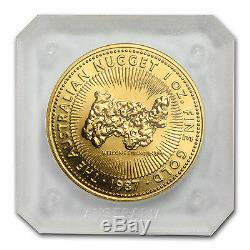 The 1987 1 oz Gold Nugget features the "Welcome Stranger" nugget found in 1869, design by Dr. The Raphael Maklouf effigy of Her Majesty Queen Elizabeth II and the monetary denomination are shown on the obverse. Each coin comes in a plastic capsule. Q: Can I cancel my order? A: Once your order is completed it cannot be cancelled. Please be certain of your order before finalizing. There are no added commissions. Back Ordered Items Supply and demand problems occasionally occur in our business. The term "Precious Metal" means Gold, Silver and Platinum along with the Platinum group of elements: rhodium, osmium, ruthenium, Palladium and iridium. Precious Metals are characteristically lustrous, ductile, rare and nonreactive. A Product may include, without limitation, Bullion; a Coin, whether Numismatic, Semi-Numismatic or not a Precious Metal; and/or supplies. The term "Semi-Numismatic" means a Coin that has both Bullion and Numismatic value. No other relationship, including, without limitation, any agent-principal relationship, any employee-employer relationship, any franchisee-franchisor relationship, any joint venture relationship or any partnership relationship, between APMEX and you exists. You may not assign any of your rights or obligations under these T&C without the prior written consent of APMEX, which may be granted or withheld by APMEX in its sole discretion. This contract, including but not limited to the T&C, shall be binding on all permitted assigns and successors of APMEX and you. It is APMEX's goal that any disagreement or dispute be resolved expeditiously. If an amicable resolution cannot be reached, you agree that any and all disagreements and disputes between us shall be resolved in accordance with the following paragraphs: (a) Forum Selection and Governing Law. All such disputes shall be resolved exclusively in such federal and state courts, as appropriate, in that jurisdiction. You hereby consent to personal jurisdiction and venue in those federal and state courts for the purpose of resolving any disagreements or disputes between us and waive all objections to the jurisdiction of such federal and state courts. Any action arising out of or relating to these T&C shall be governed by, and interpreted in accordance with, the laws of the State of Oklahoma, without regard to conflict of laws principles. (b) Waiver of Jury Trial; Arbitration. If APMEX cannot perform any obligation hereunder as a result of any event that is beyond its control, APMEX's delay or failure to perform such obligation shall be excused and APMEX shall not be liable for any damages as a result of, or in connection with, such delay or such failure. You shall execute and deliver such other documents and take such other actions as may be reasonably requested by APMEX to carry out your obligations under these T&C. Except as otherwise provided herein, all notices and other communications to APMEX shall be directed to APMEX, c/o Chief Financial Officer, 226 Dean A. McGee Avenue Oklahoma City, OK 73102, and all other notices and other communications to you shall be directed, at the option of APMEX, to the address that you provided to APMEX at the time of your registration. A decision or a failure by APMEX to take action with respect to any non-compliance by you of your obligations to APMEX or to insist upon strict adherence to any term in these T&C, does not affect the ability of APMEX with respect to any other non-compliance by you, and does not waive or limit APMEX's right thereafter to insist upon strict adherence to that or any other term, whether of a similar or dissimilar nature. The section headings are included for ease of reference and do not affect the interpretation or the scope of these T&C. These T&C are intended to be enforceable to the fullest extent permitted by applicable law. If any term of these T&C is held to be unenforceable for any reason, such unenforceability shall not affect the other terms of these T&C, and the term that would otherwise be unenforceable shall be enforced to the fullest extent that it would be enforceable. APMEX may amend these T&C at any time by posting the amended terms on the website, and such amendments shall become effective immediately. If you become aware that you may be required to make any disclosure of such information, including, without limitation, as a result of the receipt of a subpoena or other compulsory process, you shall promptly notify, in writing, APMEX and you shall cooperate, in good faith, with APMEX in obtaining a protective order or other appropriate relief, if any, with respect to such disclosure. 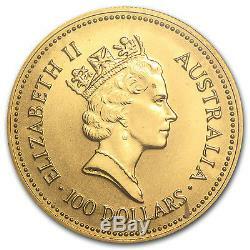 The item "1987 1 oz Gold Australian Nugget Coin SKU #82263" is in sale since Tuesday, April 14, 2015.